Contrary to popular belief, the word kielbasa ​does not refer only to the large smoked links commonly seen vacuum-packed in grocery stores. Kiełbasa is the generic word for sausage, so whether it's smoked, fresh or cured, a kielbasa will always have a modifier to describe just what kind of sausage it is. Biała kiełbasa (BEEYAH-wah keeyehw-BAH-sah) is fresh, uncooked and unsmoked sausage, usually made from pork shoulder and sometimes a little beef and veal, seasoned with salt, pepper, garlic, and marjoram, although this varies from family to family. It is boiled and browned or baked or even sautéed with onions. It is served hot or cold often with chrzan or ćwikła, with sauerkraut or noodles, and as a sandwich on rye bread. While eaten year-round, it is indispensable for Easter and Christmas, and in żurek soup on Easter morning. Kabanosy (kah-bah-NOH-sih) is the generic term for any thin stick sausages. They are usually made of pork, salt, pepper, garlic, allspice, and sometimes caraway or crushed pepper for a spicy note (kabanosy pikantne). They are also made with chicken (kabanosy z kury) or other meats according to the village's custom. They are smoked and dried for a firm texture and eaten at room temperature as a snack or appetizer. Kabanosy is often taken on hiking or camping trips because they require no refrigeration, like many other dried sausages. Kiełbaski myśliwska (keeyehw-BAH-skee mish-LEEF-skah) is a smoked and dried sausage made of pork with a touch of crushed juniper berries. Hunter's sausage gets its name because its lack of moisture makes it resistant to spoilage and the perfect food for hunters in the field. Krupniok (KRROOP-​nyee-ohk) is a Silesian blood sausage that is dark and has more blood than barley (or variously, buckwheat groats—kasza). Its cousin, kiszka (KEESH-kah), also known as kaszanka (kah-SHAHN-kah), is lighter in color and has more barley or buckwheat than blood. It was originally made to use up the scraps—ears, snouts, organ meats—after slaughtering a pig and was fleshed out with spices and barley or kasza. Today, better cuts of meat are used. The mixture is cooked and then stuffed into the sterilized large intestine of a pig. It can be served at room temperature without further cooking or either grilled or pan-fried with onions. Parówki (pah-RROOF-kee) are Polish frankfurters made of finely puréed seasoned meats that are lightly smoked. They can be boiled, grilled, pan-fried, or served as a cold cut. Serdelki (​sehrr-DEL-kee) are classic Polish hot dogs made with, usually, natural casings stuffed with seasoned pork and veal that has been lightly smoked. They can be grilled, panfried, warmed in hot water and served on a bun or with sauerkraut and potatoes. Kiełbasa weselna (keeyehw-BAH-sah veh-SEL-nah) or wedding sausage is a double-smoked pork sausage (hence its dark color) with a hint of garlic. It was typically served at weddings and other important events to sober guests up before going home. Wedding sausage is meant to be served at room temperature as a snack or appetizer. Kiełbasa jałowcowa (​keeyehw-BAH-sah yah-vohv-TSOH-vah) is a semi-dry sausage made with pork and crushed juniper berries smoked heavily over juniper wood. It doesn't require refrigeration and is best when served at room temperature, making it ideal for picnics, hiking, and other outdoor events. Kiełbasa ​czosnkowa (keeyehw-BAH-sah choh-sin-KOH-vah) is literally "garlic sausage" and is made from cured pork, salt, black pepper, marjoram, and sometimes coriander and paprika, and liberal amounts of fresh garlic. It is simmered in hot water and then lightly smoked and is ideal for grilling, as a cold cut, with scrambled eggs, or in stews like bigos. 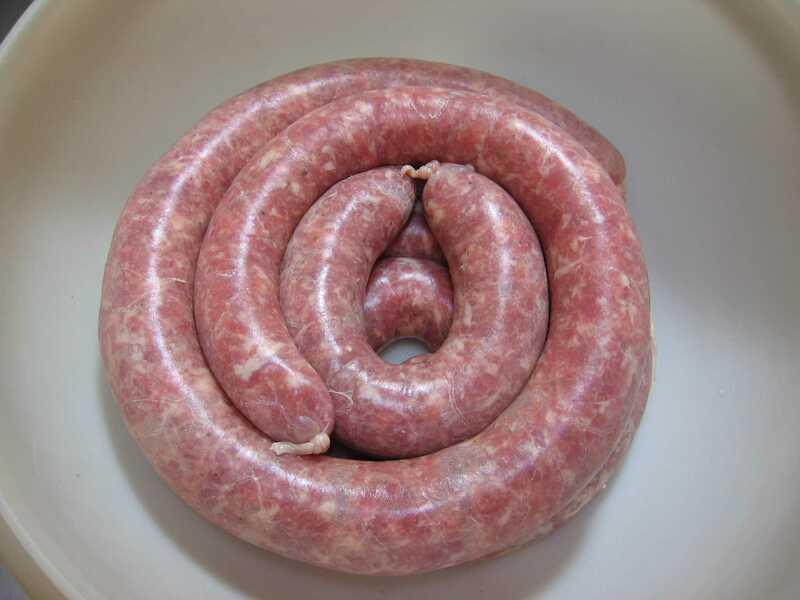 Kiełbasa krajana (keeyehw-BAH-sah krrai-AH-nah) or country sausage is a double-smoked sausage made with chunks of pork instead of ground pork in a thicker casing. It's great as a cold cut but also ideal for the grill. Kiełbasa ​grillowa (keeyehw-BAH-sah grree-LOH-vah) or barbecue sausage is a juicy and lightly spiced pork sausage that is already hard-smoked and doesn't require long grilling time. It's also great when pan-fried or heated in hot water. Kiełbasa zwyczajna (keeyehw-BAH-sah zvih-CHAI-nah) gets its moniker because it's a typical or ordinary sausage made with cured pork, salt, pepper, marjoram and fresh garlic. It's simmered in water and then lightly smoked. 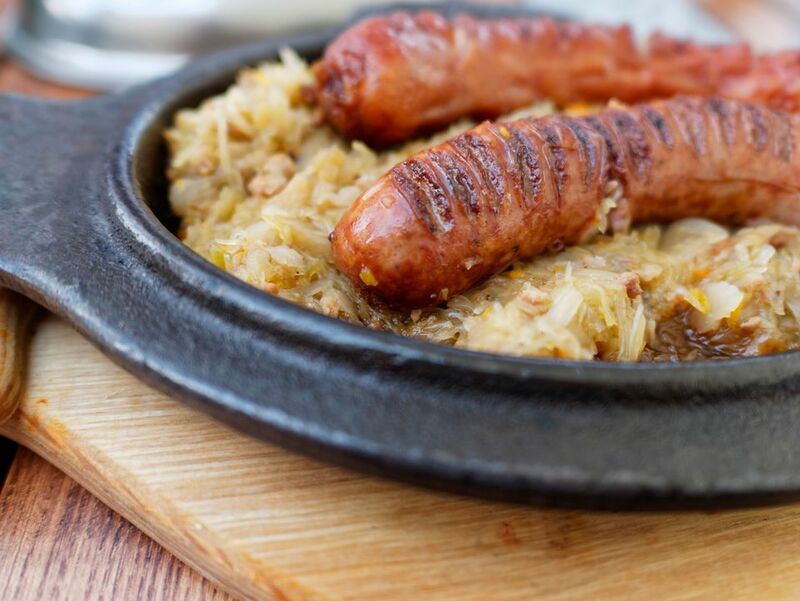 It's a good grilling sausage, cold cut and ideal with scrambled eggs, with sauerkraut and in stews like bigos. Kiełbasa żywiecka (keeyehw-BAH-sah zhih-VEEYETS-kah) gets its name from the Żwiec region of southern Poland where Żywiec beer comes from. It's made with diced pork and sometimes a little beef, and seasoned with salt, pepper, and garlic. It's hardwood-smoked and is perfect as a cold cut on sandwiches, with scrambled eggs, even on pizza. Kiełbasa cygańska (​keeyehw-BAH-sah tsih-GAIHN-skah) or gypsy sausage is a dark, deeply smoked sausage made with seasoned pork, salt, pepper and garlic that is best eaten at room temperature as an appetizer. Kiełbasa Krakowska (keeyehw-BAH-sah krrah-KOHV-skah), made in the style of Cracow, comes in three varieties—dry (sucha), semi-dry (obsuszana) and steamed (parzona). All three are made with seasoned lean pork. Krakowska is ideal for eating as an appetizer or on a sandwich. Its garlicky aroma permeates the room! Why is Kwas Used as a Sour Starter in Polish Cuisine?